This Friday, two rock stars will face off at your local cinemaplex. On the heels of wife Gwen Stefani's turn as Jean Harlow in The Aviator, Gavin Rossdale (of the band Bush) plays Balthazar in Constantine. 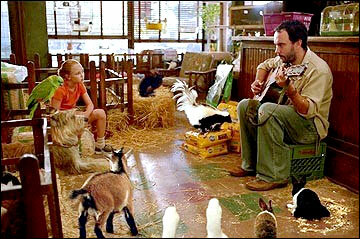 Meanwhile, Dave Matthews plays Otis, an ex-con who sings to animals, in the film adaptation of the children's book Because of Winn-Dixie. Who will deliver the more impressive performance? Who's cuisine will reign supreme? I say Rossdale, because Matthews plays a troubadour (not a real stretch for him), whereas Rossdale plays SATAN'S EMISSARY. His British accent doesn't hurt either. The winner of this week's Lee Strasberg rock star acting challenge will go on to face Bowling For Soup next Friday. The pop band appears in the horror film Cursed. 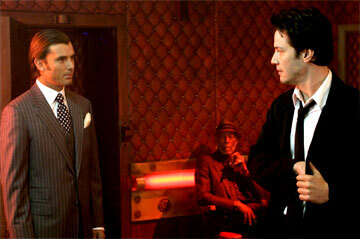 If Rossdale advances (as expected), it'll be a battle of former chick flick players. Rossdale had a supporting role in Little Black Book, starring Brittany Murphy, while Bowling For Soup was the prom band in Crossroads, the infamous Britney Spears vehicle.